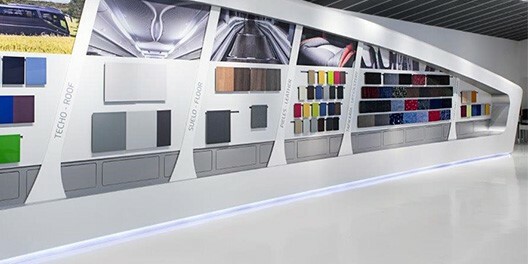 Glacier White colour Corian® has been used for the new headquarters and showroom of Irizar Group. Dab Leioa workshop has supervised this complex technical project with a high number of moulds and sheets made of this material for this particular design. Nothing better and more suitable than the Corian® material to shape the new headquarters of a company based on two fundamental premises: forward-thinking and technological traits and their eyes set firmly on the future. 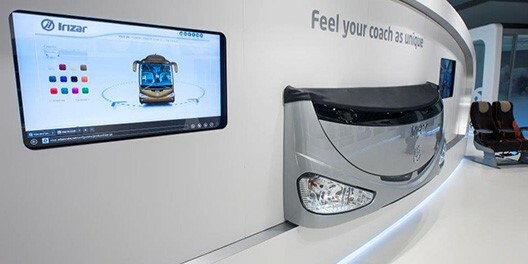 It is precisely this idea that the Irizar Group -worldwide reference in the manufacturing of buses and coaches for passengers transportation with 125 years of experience- wanted to convey when renovating its headquarters and showroom in Guipuzcoa. The company has used this advanced performance techno-surface to achieve their main objective. Most of the facility’s pieces and linings have been shaped using a selective Glacier White -with a precise and integral work carried out completely in their Dab Leioa workshop- and exclusively conceived and designed for the client. 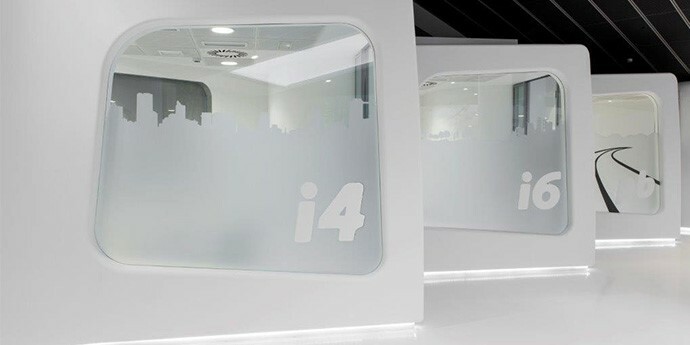 From the reception desk and its back panelling, to all the lining of the premises, as well as the displays, furniture, columns, counters, and meeting rooms, all have been manufactured with DuPont™ Corian®. On the second floor, with 1,200 square meters, a contemporary and innovative space has been developed for coach definition, client’s reception and brand experience. The showroom includes all the upholstery and lining options of the Group, physically and virtually, to create bespoke designs of the coaches for their respective clients. For this reason and to cover the needs and functionalities of each area of the headquarters, Dab Leioa workshop has created a high number of different molds and about 120 sheets of approximately 6mm each made of Corian®. A much needed and complex technical development has been undertaken in order to cover the variety of different elements that encompass the totality of the space as a whole. The thermoforming ability of this material, as well as its high performance in terms of strength, durability and maintenance, have been the key factors that prompted the person responsible for the project to choose this material. Txema Otero Villanueva, the person in charge and project coordinator, highlights that the selection of Corian® is due “to the versatility of the material to achieve any kind of shape -however complex- and to its final finishing that allows us to convey a feeling of high quality and design within each one of the elements that form the showroom”. This material, not only meets the necessary technical conditions to withstand the normal hustle and bustle of this type of space, but also ensures the carefully selected, contemporary, minimalist and futuristic aesthetics that the space calls for. Otero continues “what we like the most is the final finishing of the material and how it withstands the test of time as well as its maintenance and neatness. Had we chosen other type of solution, after a while, we would have had to do some kind of maintenance, instead, with Corian®, the premises remain like the first opening day”. In addition, “the two other advantages that Corian® has provided us with are the fast execution ability and its flexibility to adapt to the changes occurred during the assembly process”, concludes the project manager. Ultimately, the design of the Group’s new building seeks to welcome the visitor and convey an image of an up-to-date and strong brand, consolidated and in constant evolution, where the future and the technology play an important role. The curving and sinuous shapes that have been designed using the Corian® techno-surface inspire a cutting-edge and in constant movement atmosphere that provides a feeling of moving forward, always looking towards what is yet to come. Everything, through the clean and precise pieces that have been conceived with this material, emphasizes the references to the roads that create an enveloping and deliberate rhythm in any landscape.